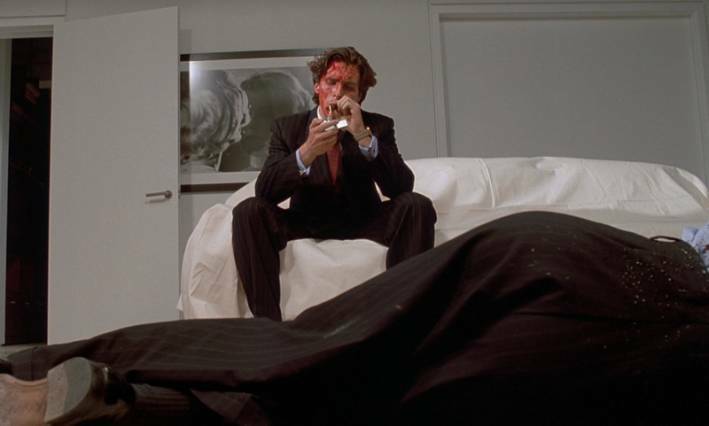 A Morning Skincare Routine, Inspired by "American Psycho"
Whether you’ve got your morning routine down pat, or you’re skimping on it completely, we think Patrick Bateman, the well-dressed, egocentric, materialistic serial killer from American Psycho is worth studying. Patrick Bateman got a lot of things wrong (y’know, like the serial killing), but one thing he got very right was understanding the importance of taking care of his skin. The morning routine scene is how we meet Mr. Bateman in American Psycho, first in the 1991 book, and later in the movie, released in ‘00. That guy’s got one fully stocked medicine cabinet. While Bateman (played by Christian Bale) focuses more on using as many products as possible – rah rah, ‘80s materialism! – rather than necessarily using them correctly, we’re still on board with a well-maintained morning skincare routine. Bateman memorably performs his morning stretch routine wearing monogrammed Ralph Lauren boxers, a Fair Isle sweater, and a gel eye mask. Then he showers, and then he puts on his cologne (Paul Sebasitan in the book, YSL Pour Homme in the movie). All while listening to the latest Talking Heads album, natch. Because we’re a little psycho ourselves, we compiled a list of everything the angry banker used in the book and film. Anything missing doesn’t exist anymore, like the line of shaving products he used by YSL (RIP). Bateman appreciates quality, and even though he doesn’t use them all correctly, and he uses way too many at once, everything he uses is high quality. What you put on your skin is as important as what you put in your body. He shies away from putting alcohol on his face because it will age you. THIS. IS. SO. IMPORTANT. People with oily skin naturally get wrinkles way later in life. That’s why we moisturize. We want to keep the skin as hydrated as possible to keep it looking young. Bateman knows moisturizer should be used on moist skin. He mentions in the book that he splashes water on his face and then applies moisturizer to damp skin to lock in the moisture. This is correct. Adds to his creepiness factor, sure, but correct. He’s man enough to get regular facials. They say a facial every month is what it takes to have perfect skin, but if your spa is being honest with you, you really only “need” one every four months. Obviously it depends on the facial – you can get a hydrating facial as often as you want. If your facial ends with a peel, you only need that once every four months. Curious about facials, but don’t want to, like, book a facial? Go with your girl. Everyone knows about couple’s massages, but couples’ facials can totally be a thing too. Well-groomed digits need not be a “girl thing.” Really. If you have to pick just one, go with the pedicure. Trust us when we say clean feet are such a turn on, you have no idea. ARE YOU A “READ THE BOOK” OR “WAIT FOR THE MOVIE” KINDA GUY?